Another excellent selection of songs compiled into one convenient fake book! Recently revised to include 435 new songs - for a total of 1075 songs! Features: Guitar chord frames * Plastic-comb binding * Index by musical category - big band, Broadway, Christmas/inspirational, college, country, Hawaiian/Polynesian, '50s, '60s, '70s, '80's and '90s, singalongs/special request & novelty tunes, standards, blues/Dixieland/jazz, Latin rhythms, polkas, and songs in 3/4 time. Song highlights include: All My Loving * American Pie * And I Love You So * At the Hop * Autumn Leaves (Les Feuilles Mortes) * Barbara Ann * The Birth of the Blues * Bohemian Rhapsody * Born Free * The Boy From New York City * Cabaret * Can You Feel the Love Tonight * Candle in the Wind * Chariots of Fire * Colors of the Wind * Crazy * Crocodile Rock * Do You Know the Way to San Jose * Don't Cry for Me Argentina * Dust in the Wind * Fever * Fire and Rain * (Meet) the Flintstones * Forrest Gump - Main Title (Feather Theme) * Free Bird * From a Distance * The Girl from Ipanema (Garota de Ipanema) * Hello, Dolly! * Hey Jude * I Heard It Through the Grapevine * I Left My Heart in San Francisco * I Mean You * I Write the Songs * If I Were a Bell * Imagine * Kansas City * The Keeper of the Stars * King of the Road * Longer * The Man That Got Away * Me and Bobby McGee * Michelle * Mickey Mouse March * Misty * More (Ti Guardero' Nel Cuore) * Peggy Sue * The Power of Love * The Rainbow Connection * Raindrops Keep Fallin' on My Head * Route 66 * Ruby Baby * Sentimental Journey * Somebody * Somewhere in Time * Somewhere, My Love (Lara's Theme) * Song Sung Blue * Spanish Eyes * Spinning Wheel * Star Dust * Stormy Weather (Keeps Rainin' All the Time) * Take Five * Take the inch.A inch. Train * Unchained Melody * Wave * The Way We Were * We Are the Champions * We Will Rock You * What a Wonderful World * What the World Needs Now Is Love * Wooly Bully * Y.M.C.A. * You Don't Bring Me Flowers * You're So Vain * You've Got a Friend * Your Song * Zip-A-Dee-Doo-Dah * and hundreds more. B-Flat Edition means is has been "transposed" for use by musicians that play iB-Flat instruments!!! I'd like to see the 4th Edition "C" book transposed for B-Flat instruments!! 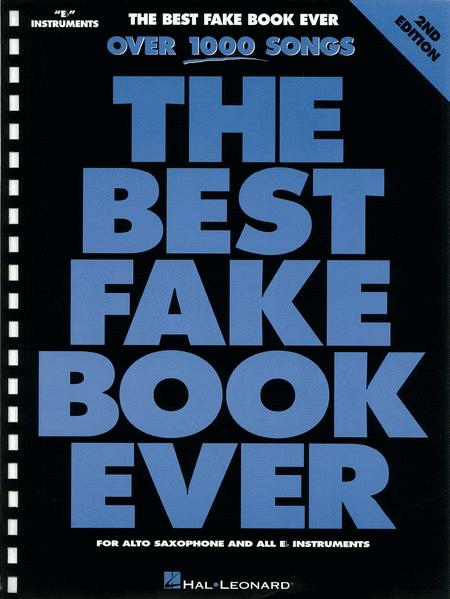 I've been using 'fake books' for over 45 years! This is a good book.! 47 of 68 people found this review helpful. 65 of 124 people found this review helpful. No music library, even at home, should be without this book. 59 of 97 people found this review helpful. I am a band director for a marching band. The kids are ages 9-13. They just love this book, i wish i had found it earlier. 61 of 101 people found this review helpful. The book makes playing fun again. Some of the the tunes are written in so many sharps that they don't sound like the old tunes I remember. 57 of 92 people found this review helpful.